Effective school year 2016, at least 3,200 public elementary pupils from Pandacan in Manila and San Pascual municipality in Batangas will enjoy learning from well-trained teachers in world-class computer laboratories. The project, called Caltex- AFI Global Filipino Schools ICT Classrooms as primarily sponsored by Chevron Philippines Inc. (CPI), marketer of the Caltex brand of fuels and lubricants, addresses the need to keep up with the 21st century education in information, communication and technology (ICT) by building comprehensive computer laboratories in public schools. CPI is donating nearly Php 8.4 M for the construction of the computer laboratories, while project partner Ayala Foundation, Inc. (AFI) will provide management, implementation, and training for at least 50 public school teachers in Manila and Batangas. The program is also a collaborative effort with Globe Telecom which provides the wi-fi connectivity and has been spearheading their Global Filipino Schools since 2012, as well as with the Department of Education who play a key role in sustainability and implementation. The CALTEX-AFI Global Filipino Schools ICT Classrooms complement the Department of Education’s DepEd Computerizing Program (DCP) in integrating ICT for educational gains. The program is integrated in the elementary schools’ curriculum. Each laboratory comes with a total of 24 computers, 10 laptops, projectors and wi-fi connectivity per school. “With the support of Chevron, we have chosen to implement 21st century learning at Jacinto Zamora Elementary School in Pandacan, and at San Pascual Central School in Batangas based on the criteria required by the program ,” said Ruel Maranan AFI president. 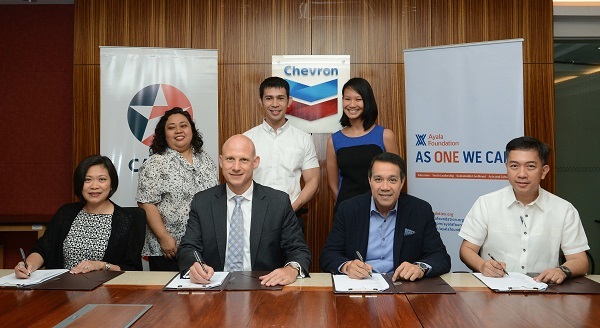 The Caltex-AFI Global Filipino Schools program is one of the undertakings of Chevron’s Energy for Learning Initiative, which supports projects that provide learning and skills to the disadvantaged.